Bigland Green Primary School wanted to transform part of their playground, cheer up a couple of boring wooden huts as well as their front wall on the street and main entrance. The school motto is 'a fun and friendly place to learn and grow', and the theme for the playground and the front wall was based on the idea of growth, a good natural theme to counteract their urban environment as well as linking in with their school motto. 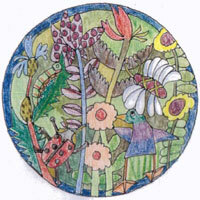 In the spring term children from Years 3, 4, 5 and 6 drew plants and all kinds of flora with Catherine and Becky and Clem from Artyface. 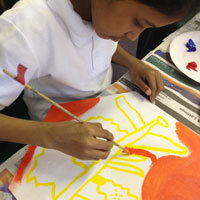 "The whole school community has thoroughly enjoyed working with Artyface. From the moment that Maud first arrived in school to discuss the brief to the completion of the work everything has been organised and executed exceptionally well. Maud and her team are great to work with. 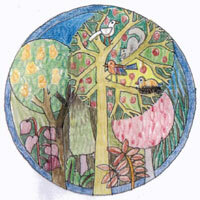 The whole experience has been a joy and completely 'hassle free'"
The drawings were collaged into 9 circular designs for mosaics that included a school sign with the school logo. 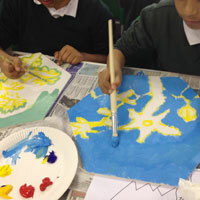 Younger children (Nursery Reception Years 1 and 2) had workshops with the artists to make richly patterned and textured leaves, as well as simpler square and circular tiles, which were taken away and glazed and fired to 1280 degrees. 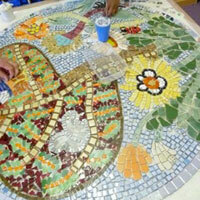 All the edges of the mosaic circles are hand-cut recycled mirror. 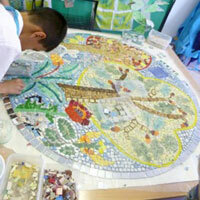 Pupils, parents, governors and teachers visited the art room over the residency to glue some tiles down, to have their input into the creative process and to learn about the collaborative mosaicing method. 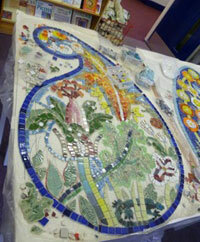 "When I did the mosaic I felt amazingly happy. I felt like I worked so well with the school. I felt so good that I took part in something. 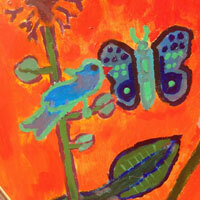 The thing I loved was spreading the soft crystal white glue on the square surface of the mosaic tile." 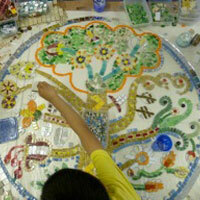 "When I was making the mosaic Rahaat, my friend, helped me. When I was in the room I felt really excited." 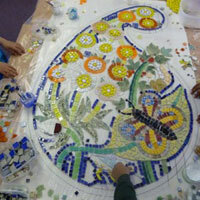 "While I was doing the mosaic I felt quite confident and I was ready. 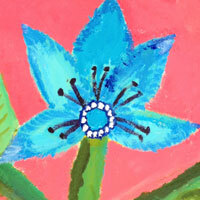 I learnt that you use special glue to stick it on." 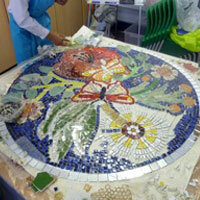 "I felt really happy and excited about the mosaic. I loved doing the gluing and ripping of the squares. I liked the noise of the thing that was used to cut the squares - clip, clop, clip clop! 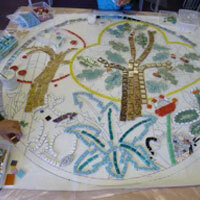 When I saw the finished mosaic I thought it was magnificent." 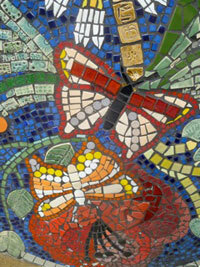 "I found the mosaics really hard. My hands got sticky. Also, I was really worried that I would lose the little pieces. But, luckily, nothing got lost. At the end I really enjoyed it." 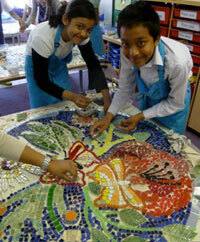 "I enjoyed the mosaic workshop and was really happy because you got to design on clay with lids and rolling pins. I liked the shapes and enjoyed it. I made flowers and zigzags. Becky helped me." 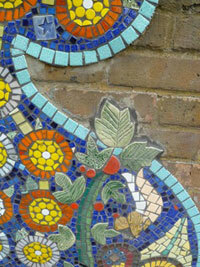 "What I did was I did some sticking for the mosaic and most of all I enjoyed it. I had fun doing the sticking and gluing. I loved doing the mosaic and I felt like I wanted to do more. I liked the picture growing in front of me." "I enjoyed feeling the clay because it felt good. The person that helped me the most was Catherine. In the clay I made flowers and shapes." 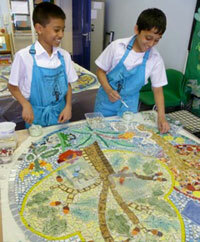 "I loved doing the mosaic because I loved sticking the pieces into the patterns and gluing in the metal things. 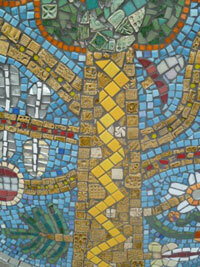 That's what I liked about the mosaic." The final results went up on the street over the summer and the reaction from passers-by and excited pupils was heart-warming. 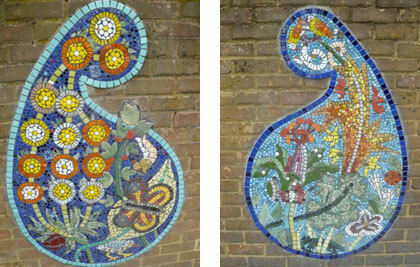 They brighten up the school entrance and will be a fun and inspiring part of the local streetscape for decades to come. 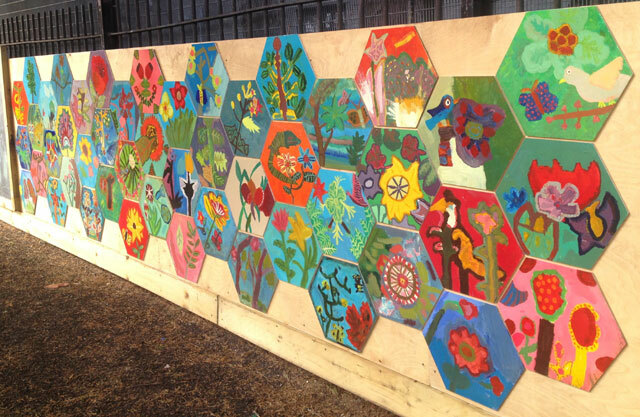 Pupils painted their own wooden hexagons based on their drawings made at the beginning of the residency with Artyface. 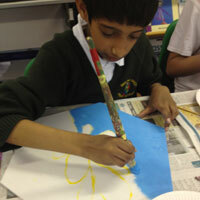 They carefully designed their painting, and learnt how to mix colours using 2 yellows, 2 reds and 2 blues with a bit of white. 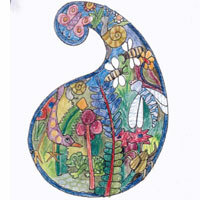 They painted onto sustainable marine plywood. 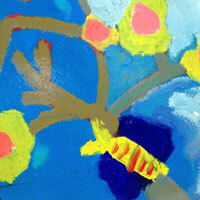 There is a hot and cool yellow, the same with the red and the blue. The results are delightful and these have been varnished with yacht varnish and put up in the playground to be enjoyed for years to come. 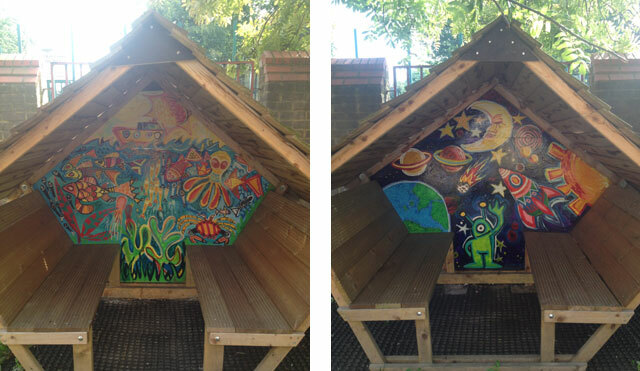 Painting the wooden huts was a nice job to do in the summer term with pupils: one hut had a theme of space and rockets and the other an underwater theme. These were also yacht varnished to help preserve them. This part of the brief personalized the standard wooden huts for playtime and would also help creative and imaginative play..